One in every 13 children has a food allergy, so this Halloween consider passing out some allergy-free candy. The following treats are all free of the eight most common food allergens: milk, egg, peanut, tree nuts, soy, wheat, fish and shellfish. 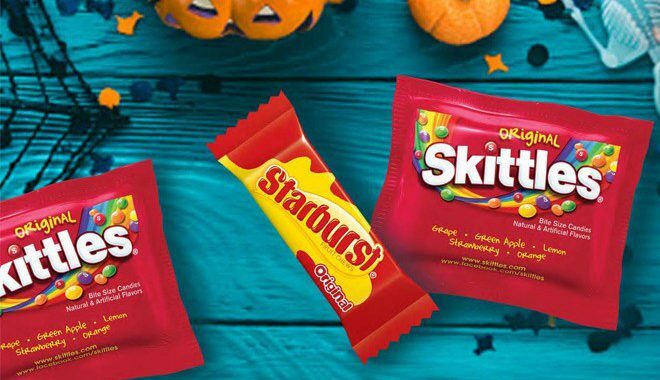 Posted in Food allergies, Food Allergy, Peanut Allergy, Uncategorized and tagged allergy-free candy, allergy-free Halloween, Skittles, Sour Patch Kids, Starburst. ← What Do Teal Halloween Pumpkins Mean?